So here we go again in no real order as I catch up on a few glasses that I have been enjoying or otherwise over the last few weeks. I've decided to introduce a scoring system so that anyone who wants to can play along and give their own notes and scores. If we can get a few scores I'll try to work out a crowd score that could be a nice and democratic way of giving a fairer review than my tired and jaded palate. 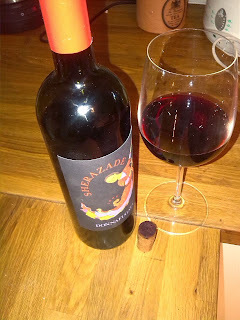 There is something I really enjoy about Sicilian wines a kind of uncomplicated generosity which lets you relax into the wine and just enjoy the upfront fruit and sweetness. The wines of Donnafugata are generally among the best that Sicily has to offer and balance ripeness and concentration of flavour with a clean refreshing mouthfeel. The Sherazade had plenty to enjoy big red fruit aromas cherry and redcurrant were most apparent to me and followed through to the palate perhaps a little too stewed for me. I was hoping for a light juicy red and this seemed over concentrated but I have had it for a couple of years and perhaps should have got stuck in sooner. I can imagine plenty of people really enjoying this wine and it may be that my preconceptions got the better of me as such I am giving it 15/20 please feel free to disagree. Please let me know what you think and if you've tried any of the wines I'd love to hear what you made of them and and scores that you'd like to offer.